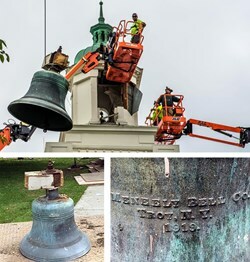 July 9, 2015 – Repair and restoration of the iconic Woodbury School clock tower is progressing with the successful removal of the structure’s 2,000-pound bell. The bell was cast by the Meneely Bell Foundry in 1919. The next step will be the removal of the cupola. The District began the restoration project this week after alert facilities staff discovered that the clock tower was leaning slightly from its vertical position. An engineering assessment determined that the structure must be removed, repaired, and restored. An architectural firm will review the design and construction of the clock tower and provide a plan for its restoration. The District has constructed a safety fence perimeter around the main building and has relocated offices from that space to the adjacent wings. Both wings of the building, the gym, and the pool buildings remain open. Once the tower is removed, the main building will be reopened. A timeline for the restoration of the tower, including the clock and the cupola, has not yet been established.